Designed for cooler climates, the LION Job Shirt is comfortable for climates where a chill is a common occurrence. Breathable Fabric: Lightweight warmth and breathability for optimum comfort. Easy On: 1/4 zip opening makes donning and doffing easy. Zip Collar: Zip-through collar keeps penetrating winds out. Pockets: Convenient hand warmer pockets and chest pocket with hook and loop closure, plus opening for pencil or pen. Easy Care: Fleece fabric provides easy care, just machine wash and dry. Built to Last: 100% cotton ripstop reinforced elbows for extended wear life. Thoughtful Details: D-ring for key attachment. 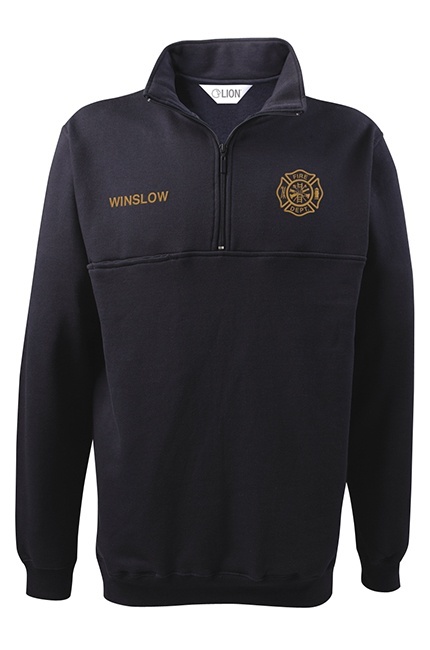 Polyester Cotton Blend: Made from 80% cotton, 20% polyester, 11 oz fleece fabric.